We sell rock tumblers made by companies and people who we know and trust. Thumler's Tumblers (Tru-Square Metal Products) and Lot-o-Tumbler (BELT, Inc.) have each been manufacturing tumblers for about half a century. We personally own and use their products and have sold thousands of their tumblers to customers throughout the United States. We believe that they produce outstanding products, treat their vendors fairly, and take care of consumers who purchase their products. All Thumler's Tumblers and Lot-o-Tumblers are covered by a limited warranty. Please see below for warranty information from each of these tumbler brands. We do our best to post warranty information for the most recently received products from these companies. If you have any warranty questions or need warranty service please communicate directly with the manufacturers below. "Tru-Square Metal Products warrants this Thumler's Tumbler in personal or family use against defects and will repair any defect free of charge for parts or labor for one year from the date of purchase. Thumler's Tumblers in other than personal or family use are warranted on the same basis for thirty (30) days. This warranty does not cover belts, barrel lids or rubber tumbling barrels, or metal cans on A/R Series tumblers. This warranty does not cover repairs necessary because of failure to operate or maintain machine in accordance with instructions. For warranty service, return Thumlers Tumbler with evidence of date of purchase to Tru-Square Metal Products, P.O. Box 585, Auburn, Washington 98071, telephone (253)833-2310. This warranty gives you specific legal rights, and you may also have other rights which vary from state to state." "Tru-Square Metal Products warrants industrial Thumler's Tumblers against defect and will repair any defect free of charge for parts and labor for ninety (90) days from date of purchase. This warranty does not cover repairs necessary because of failure to operate or maintain machine in accordance with instructions. For warranty service, return Thumler's Tumbler with evidence of date of purchase to Tru-Square Metal Products, 640 First Street S.W., Auburn, WA 98001. Telephone (253)833-2310. This warranty gives you specific legal rights, and you may also have other rights which vary from state to state." 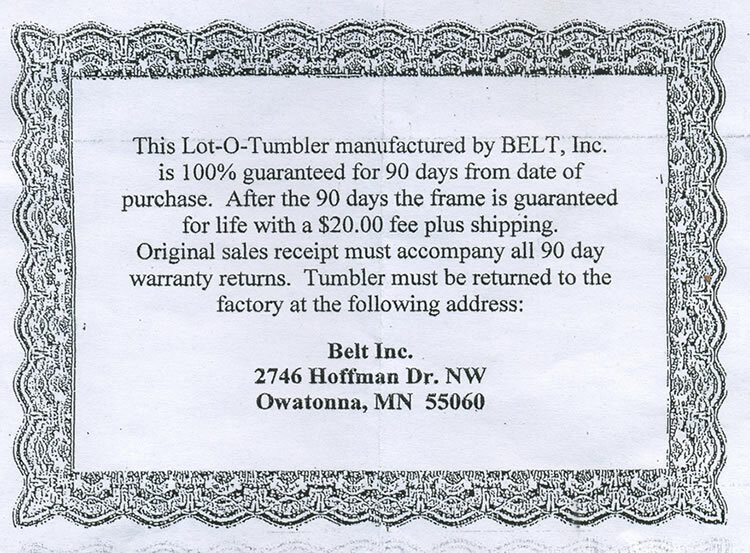 "This Lot-o-Tumbler manufactured by BELT, Inc. is 100% guaranteed for 90 days of purchase. After the 90 days the frame is guaranteed for life with a $20.00 fee plus shipping. Original sales receipt must accompany all 90 day warranty returns. Tumbler must be returned to the factory at the following address: BELT, Inc., 2746 Hoffman Dr. NW, Owatonna, MN 55060." Please direct all warranty and factory service questions to the manufacturers at the addresses posted above. They are the source of all warranty information and service. If you have warranty questions about other brands of tumblers please contact the manufacturer or the vendor who sold you the tumbler. We are unable to provide warranty information or assistance for products that we do not sell. We sell replacement parts for current-model tumblers made by Thumler's Tumblers and Lot-o-Tumbler. All of the parts listed on our website are in stock and ready to ship no later than the following business day. If you have questions about rock tumbling, please visit our Rock Tumbling Library where you will find dozens of articles covering all aspects of tumbled stones and the rock tumbling hobby. If you have questions about a recent purchase please contact us by email or use the telephone number at the bottom of your receipt. Thank you.